The common names for the bushy hardy perennial Aruncus include Spiraea and Goat's beard. It is a native of central Europe. The plant usually flowers in the early summer. 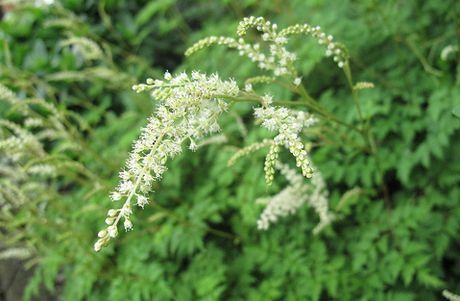 Plants of the species Aruncus tend to be bushy in nature and can have plumes of white flowers that are carried upon long arching stalks. Spiraea can be quite large in size reaching heights between one and two metres in size. This makes them ideal for growing at the back of borders. They are ideal plants to make a water feature appear natural. Native: Asia, Europe, North America. Flower Details: Feathery plume of tiny white blossoms up to 10 inches (25cm) in length. Sow Outdoors: Surface. Well after the last chance of frost. Spacing 24 to 60 inches (60 to 120 cm). Sow Indoors: Germination time: 1 to 3 months. Temperature 55 to 65°F ( 13 to 18°C), Sow in Late Winter and Early Spring. Transplant outdoors in spring or autumn. Requirements: Part shade. Moist Soil. Rich soils. Regular watering to keep soil moist. Feed every spring. Cut back to ground in late Autumn. Propagate by dividing mature plants in spring. 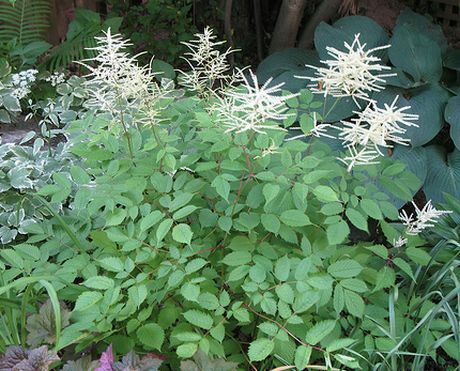 When planting Aruncus outdoors it is best to sow out the seeds on the surface in the spring after the last frost, and when the earth is warming up. If preparing Aruncus species such as Spiraea and Goat's beard for planting as seedlings, it is best to sow the seeds indoors one to three months before planting out at a temperature of 13 to 18 degrees Celsius. The seedlings can be transplanted either in the spring or the autumn into a partly shaded part of the garden, into a moist rich soil, and should be spaced 5 to 15 cm apart. Aruncus is fairly easy to look after. Soil should be kept moist while growing. Fertilizer should be applied in the springtime and the stem of the plants cut back to the level of the ground in the autumn. if you require more plants, then they can be divided once established to supply more plants.